This past weekend I had a lovely adventure. 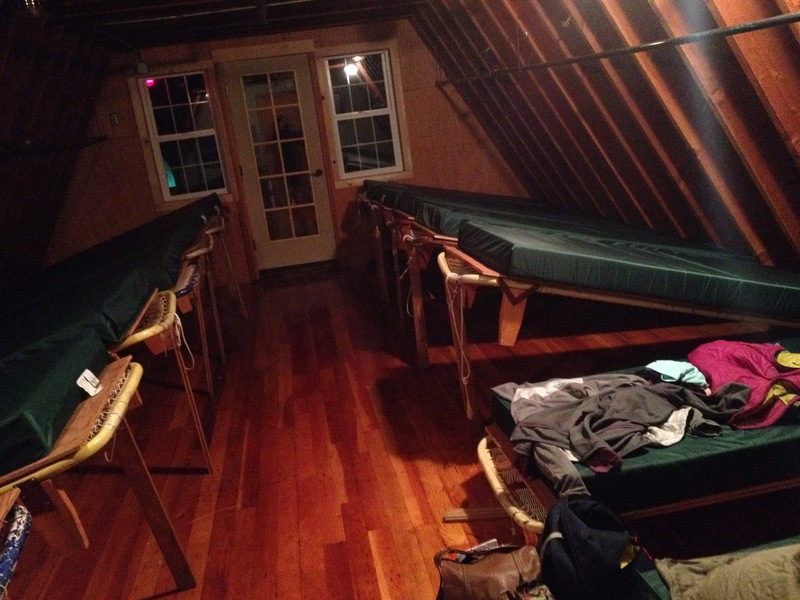 I slept in a bunk in the Washington Alpine Club cabin, my clothing for the next day on the bunk beside me in the completely empty women’s dormitory. As I fell asleep I could hear the other folks turning on creaky springs and the red light outside the window cast across the wooden floor of the empty room. The last time I was at this cabin was around this time of year, two years ago, peering into the windows. That day I took a picture of heart-shaped snowmelt. We dunked our feet into an icy creek, we walked across the bridge to the grassy slopes of Alpental. I’m doing this a lot lately– smashing that timeline into this one. I can’t help it. I’m doing something new but old– gear is spread across a bed, is going into a pack, coffee is made early, but this time it’s my pack, it’s my gear, it’s my coffee. This time I’m the blinking at a trailhead, laughing and sweating with my friends. We get to the trail at 6:15 AM but we could have been there earlier– we were all awake. Bob Dylan played off of a phone, coffee was passed around the kitchen, our packs were thrown into a car for the short drive to the trail head and now we bounce on the balls of our feet, eager to leave, waiting for the later team members to tear into the parking lot. We hit the trail and start playing a game. Marilyn Monroe. Michael Jackson. John Lennon. Luke Wilson. The names move up and down our line. Some letters stall us and we throw out hints to each other. A president. Woodrow Wilson! Doubles… way to go! Soon we’re at rock slide and picking our way across like awkward goats. Snow mixes with stretches of mud and then it’s all snow. Or, mostly snow, minus the boulders and gaping holes. The mist burns off and we can see the ridgeline on the horizon, the dip of Pineapple Pass, the jutting edge of The Tooth. We stash our poles, put on helmets and grab our ice axes and follow the steps up the hill, breaking new trail where we need to. There are other parties ahead of us, plus our rabbit team. We congregate in a safe place and wait. We sing. We laugh. We sing some more, laugh some more. The actual climbing isn’t remarkable until the final pitch. A catwalk stretches to climbers’ left and looks sketchy at best, especially in boots that still feel awkward. But once there, the hands are solid, the feet good, and the exposure beautiful. I am the first up from our student group and each time someone joins me we shout out hello, we high-five and fist pound. We are all smiling. Any climb with a crowd, with another crowd in front, involves a lot of waiting. And there was waiting. 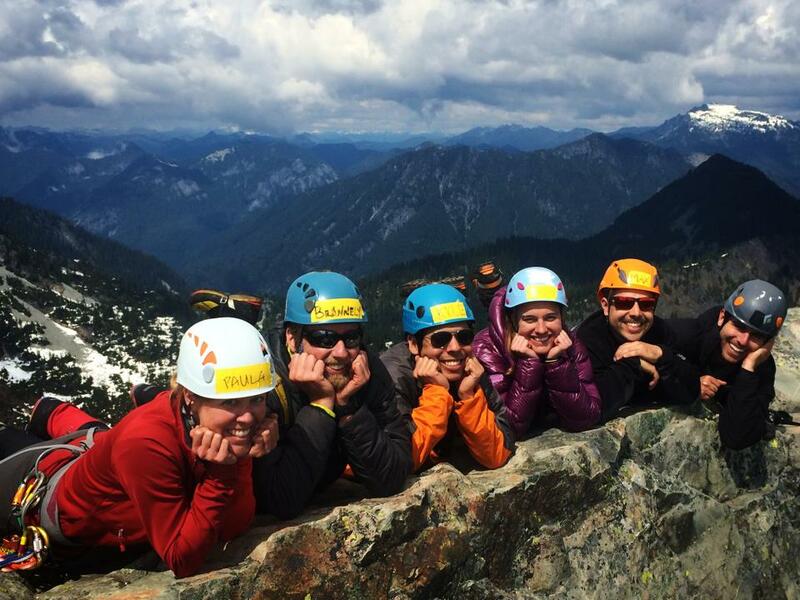 I talked to two of the women at the summit who were there with the Mountaineers. You all seem to know each other they said. Well yeah, we’ve been doing this for weeks together. And as I said it, I realized how strange that was. We’ve been doing this thing, class in a church basement and weekend ventures, with people who were complete strangers. I know these people better than I know people I’ve known for years. I trust these people, I care about these people. I grew up knowing that mountaineering kills. My parents had the list of names and accidents. I will never forget the sound my mother made when she found out that her mentor Paul Duvall died. The noise of grief is described sometimes as a keening sound. Keen sounds almost too clean for the primal wail that came from her as she fell onto her knees in the backyard. At the time it was terrifying. It’s even scarier now that I understand what it means to trust someone on the other end of a rope. It’s an intimacy that is unmatched. I used to be so afraid of mountains. My best friend disappeared into them every weekend and I dreamed up a thousand ways for him to die. He froze, he fell, he bled. His body was never recovered, was recovered mangled, was frozen solid at the bottom of an ice slide. He came home safely every time, his car smelling of chalk and sweat and metal, his clothing stained white with salt. He knew for sure that he would die in the mountains and yet he didn’t. I remember watching a video of an avalanche where, amazingly, the skier survived. I remember the animal noises the skier made while he was buried. I remember imagining him in that place, those noises from his throat. And now I find myself staring up at a slope with only boots on– moving slowly across terrain that I’m only learning how to evaluate, trusting the trip leaders, unable to tell him– I get it. I understand why you keep going back. This is maybe the hardest part of the class I’m taking. And then I’m at the summit of something, and there is so much laughter. The sun is on our faces, we are laughing, we pose and joke and look around us and get ready for the descent. We have been lucky– we have had good weather, we have avoided serious injury. I don’t know how long I will be lucky. I don’t know how long my friends will be lucky. I grew up knowing it’s a matter of time, but I hope I’m wrong. I hope that everyone I know remembers– we do this for the people we do it with. For the stupid songs and games and smiles, where our object is to come home safe and summiting something is a secondary goal. I hope that everyone remembers to talk and communicate and evaluate, but I know that we get complacent. We overestimate our skill or we forget to check back ups or whatever it is that we do that fucks up. It’s an accident, and it’s almost always preventable but that doesn’t mean it won’t happen. Tonight in class we were asked– when you take risks, who does it impact? So tonight I’m thinking about all of the people I love, about the community I’m fortunate to be part of, and about what all of this means to me. And I hope that, at every trailhead, I can remember this feeling and that I can come home safe. I already know people who haven’t, people who were sons and daughters, lovers and friends. I have already sat on a porch with unbelievable news in front of me, not able to believe that there is a smile I will never see again, a friend grieving the loss of her partner, and absolutely nothing I can do. This thing that we do– it is dangerous, but we chose it.